The classic berry genetics which came to the Netherlands from Goa, India are responsible for many great cannabis strains, and Blueberry 420 is one of them. A potent cross of Indica with a splash of Sativa from Light of Jah, Blueberry 420 has the trademark berry taste of Blueberry and the sheer power of Light of Jah, and is responsible for delivering a very potent high. It’s also a very rewarding plant to grow – it produces generous buds and it has a short flowering time, but it might be too much for an inexperienced grower to handle. In the visual department, Blueberry 420 is a strong-looking, sturdy plant which produces plenty of leaves whichreflect the plant’s mixed heritage. There’s not a lot of frost to be found on the leaves, but in the case of Blueberry, that’s a good thing because the frost stays where it should be – on the buds. And the buds are a magnificent sight to behold – blue and violet, with plenty of resin, thetrue beauty queens among the marijuana strains. 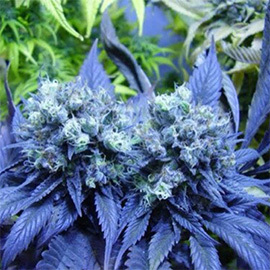 Blueberry 420 is a marijuana strain with a very strong, sweet and floral smell, and a taste that is as close to eating blueberries as you can get without actually eating them, with sweet and fruity undertones that pop up beautifully to enrich the impression. And the high is just as great as the taste – it is as relaxing as Indica highs can be, but also elating to the point of euphoria. 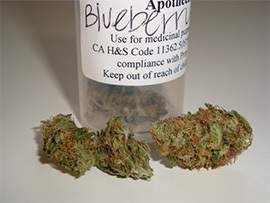 This makes Blueberry 420 a good strain to be used even during the day, which is not that common among Indica-dominant strains. Blueberry 420 is not a breeze when it comes to growing it – in fact, it requires some knowledge and experience from the grower in order to get the most out of it. There are two major points to remember when growing Blueberry 420 – it will probably need to have its fan leaves sheared, and it is susceptible to nute burn, especially during the week before flowering. Another thing that makes Blueberry 420 a tricky plant to grow is the fact that it doesn’t grow well in Sea of Green, so different growing configurations should be used instead. Still, the trouble this plant might give during growing are well worth the effort once the time for harvesting comes. If you want to buy Blueberry 420 seeds online, you won’t have to search hard to find them – a quick web search will reveal a number of different seed shops and companies that sell it online.